You know how you hear about something sometimes and just have to try it? For spinners, it is usually boucle. For dyers, it is self-patterning yarn. So, I decided to try some for the next installment of the Sock Club. A friend was kind enough to loan me Yarns to Dye For: Creating Self-Patterning Yarns for Knitting. This is a really great book with wonderful suggestions that I'm going to be using in my regular dyeing as well. I liked it so much, I've ordered one for myself. 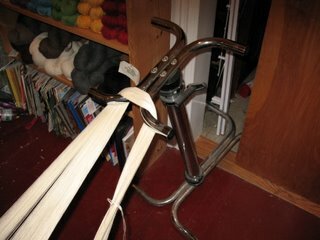 Anyway, the first thing you need to do to make a yarn self-patterning is to wind the yarn into a really big skein. In this case, 50 feet around! 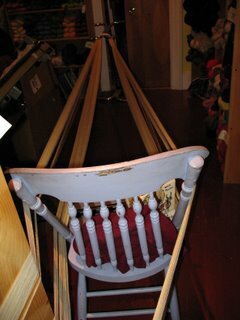 That's from the kitchen door to the front of the shop and back (using the chair as a spacer). This is not something you want to do alone! 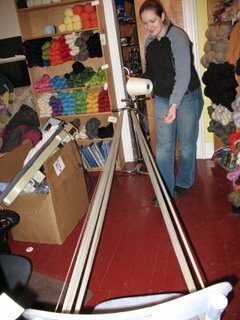 Fortunately, my friend Katie, fellow fiber-holic and all around great gal, agreed to help me. but Katie thought of using the base of my big ironing board closed in the kitchen door. Around and around we went for almost two hours. The pull of the skein is really something. 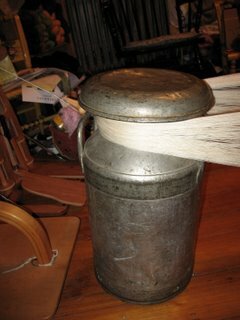 I ended up anchoring the can to my spinning wheel to keep it from tipping over and the ironing board stand would have slid right away if it hadn't been hooked in the kitchen door. When it was all wound, I tied it every yard or so and then chained it like a big crochet chain to keep it from tangling. That seems to be all Blogger will let me do right now. I'll try to post the dyeing part later today.